Refinishing wood floors with a floor edger. Before starting, you should do some stretches, before using this equipment, to prevent any back injury. Operating positions you can use are either fully stand, then, bend over to operate the machine or kneel on one knee. Whichever is more comfortable, use that one to operate a floor edger for refinishing wood floors. Sand and prepare wood floors to NWFA standards. Before we start here's a list of things you will need for this operation. 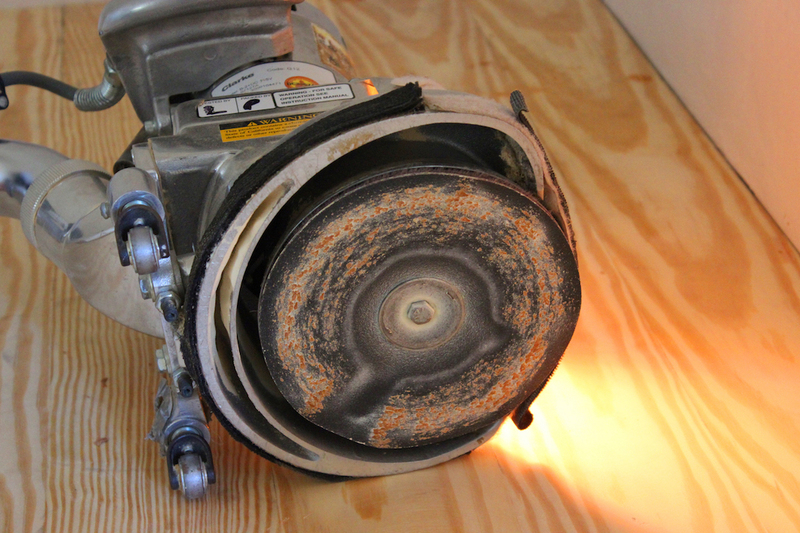 Load up your floor edger sanding machine, starting with the lowest grit. Place the maroon pad in between the machine and your sanding disc. This will reduce vibration and swirls, on your wooden floors. Caution: The disc moves in a circular pattern. 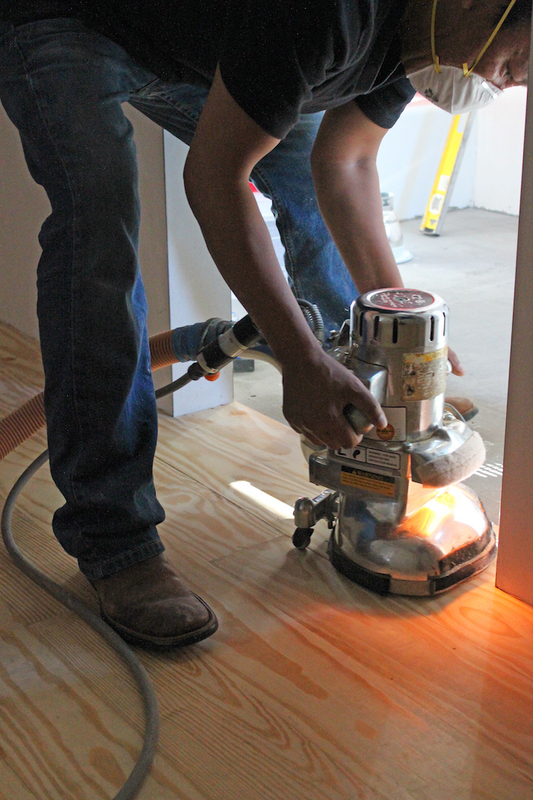 To prevent injury, don't start up the machine with the sanding disc resting on the wood floor or sand near your feet. Edger will spin out of control. Don't hurt yourself. The disc will spin in a clockwise motion. When, refinishing wood floors, operate this equipment, moving in either a tight circular or oval pattern, counter clockwise. Moving the machine the opposite direction as it rotates. Will cause the sandpaper to sand more aggressively, reduce vibration and swirls. This would be considered a conventional direction, going against the rotation. Moving the wood floor edger the same direction as it rotates. Will cause the sandpaper to float or sand less aggressively. This usually introduces more vibration and swirls onto your hardwood floor surface. This is considered climbing, going with the rotation. Always use a conventional sanding motion. Try not dwell in one area, this will create unwanted low spots, dips or gouges. The sander spins at 2300 rpm. It removes material very rapidly and can damage your floor with a blink of an eye. Back to using the hardwood floor edger. Grasp the machine firmly in your hand. Start sanding the wood floors, until, the boards and clarity are even to each other and the body of the hardwood floors. Remove all the old finish and any unwanted scratches and marks. Always keep the machine moving. You do not need to apply any downward pressure. The weight of the machine is more than enough for downward pressure. Adding any additional pressure will cause the machine to be unbalance, which can cause gouges, uneven surfaces, and swirl marks. Avoid forcing the machine, to doing anything, it doesn't want to. You will cause the flooring sander to kick back at you. Try and keep the edger balanced as possible, when you're operating it. This will ensure that you get a nice, even surface. If, the material removal rate slows down drastically, change out the sanding disc for a new one. Soft wood causes paper clogs. Reload new sanding disc when needed. After you've completed an area, stop and check to make sure that the wood flooring is even, and flat. And the clarity is to your satisfaction. This is an important step for refinishing wood floors. Inspect your work. The body and edges, should be even and flat to each other. Fix any spots, that are bad, before continuing. Repeat this process, until you've completed sanding all perimeters. Repeat the process, with each grit of abrasive, until you've finished your final grit of 100 grit. Set nails and apply wood putty to any nail holes and gaps, before starting the final grit. Clean up any saw dust as needed. You can also use the edger to refinish any small area, such as closets, halls, stair treads, stair landings, do touch ups, spot sand gouges and scratches. Where the drum sander may not be able to do so. When, refinishing wood floors, don't forget to take frequent water breaks, as needed. Staying hydrated will prevent some muscle aches. Stretch that back also. Now, we're ready to refinish hard to reach areas, under cabinets, shelves and radiators. You'll also learn how to use a hand scraper. You have done all the research and now have the knowledge. Don't choose the wrong flooring company. Why work with average, when you can work with an ideal hardwood flooring company? Avoid opting for sub-par products, poor workmanship, the lack of industry knowledge and training for the sake of something new. 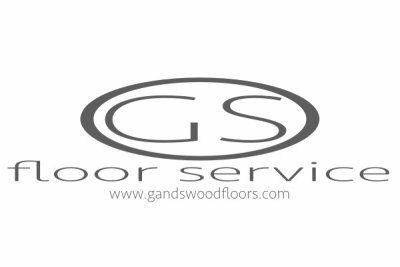 With G & S Floors, you will experience optimum personal service, with superlative, effective premium quality workmanship in the industry and high quality products. Homes are one of the biggest and most important investments and should be cared by an ideal company. We've been in business over 19 years. We are a NWFA flooring contractor and follow industry standards and best practice for hardwood flooring installation, sand and finishing. We have access to training and ongoing professional development. We have a well trained staff and we never stop learning. We have a powerful network of talented professionals, distributors, manufactures and experts. Invest in "Quality" for better service and hardwood flooring that can last a lifetime or centuries!